Facebook Messenger is one of the most popular Instant Facebook Messenger available in the smartphone application market, mainly because of the popularity of Facebook as a social networking website. The best part about this application is its clean User-Interface design, which makes a user really comfortable while chatting with anyone. Moreover, with their continuous updates, Facebook wants their audience to treat this messenger as an independent platform to chat instantaneously with their friends. Facebook Messenger has recently acquired the feature of adding a chat shortcut over your smartphone among those application shortcut available on the first screen (as soon as you open the lock). This feature is quite simple and you will have to follow certain steps mentioned below. Step-1: It is recommended that you should use this feature with only those groups or personal contacts, which frequently chat with you. Step-2: Open the chat windows over Facebook Messenger and then tap the highlighted icon (mentioned in the snapshot). 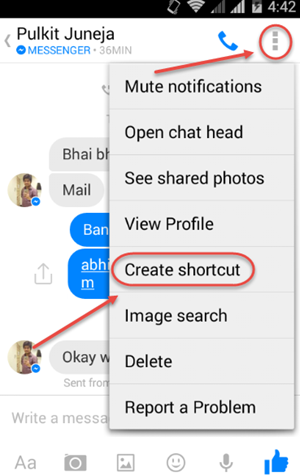 Step-3: Now you just need to choose the option named as ‘Create Shortcut’. Step-1: Well, the steps are quite similar to what has been discussed above. 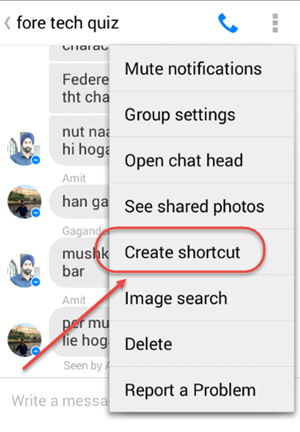 So, just open the chat window and tap for the options available on the screen. Step-2: Now Choose the option named ‘Create Shortcuts’ to add his chat icon over the home screen. That’s it!! 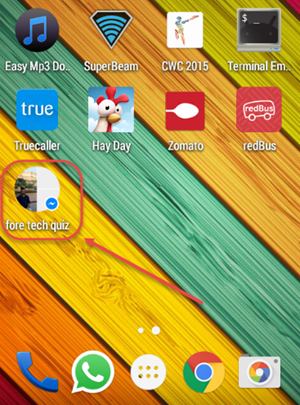 You will be able to see the shortcuts for chatting with that group or a person on your home screen. They will really come in handy in case you primarily use Facebook Messenger as a default option for getting in touch with anyone else. 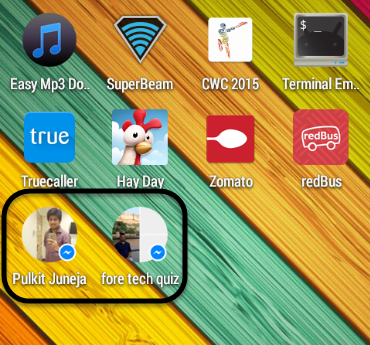 Apart from this Facebook Messenger also allows you to call your friend on VOIP, but they should also have the same messenger application on their smartphone. 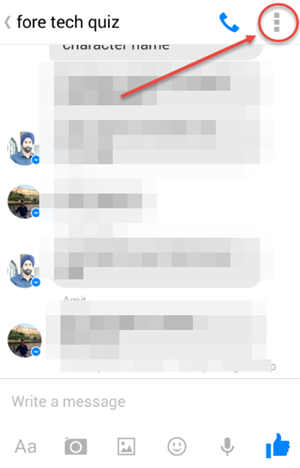 It feels as if Facebook Messenger is trying to incorporate all those new features which has been on most of the popular messengers like Whatsapp, Hike, WeChat and others. However, the kind of audience who doesn’t like to be other on these social networking website will definitely avoid this messenger. Hence, let’s see how far does these features help in the up rise of this application.